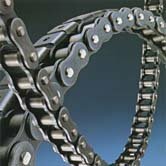 Superior wear life without lubrication-more than 14 times longer than standard roller chain (#35, #120, #140, five times longer) 1.5 to 10 times longer than brands of oil sealed chain. 1.2 to 20 times longer than lube free chain. Can directly replace ANSI roller chain, BS roller chain and previous Lambda models. Major dimensions are the same as ANSI standard.